In April, 2016, ArtWorks for Freedom was on full display at the University of Wisconsin – Madison in partnership with the 4W Initiative’s STREETS Project. 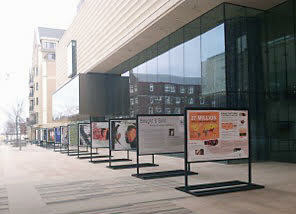 Our campaign featured outdoor exhibits, fine arts presentations and participatory arts projects. During the campaign, the Chazen Museum of Art hosted ArtWorks’ groundbreaking outdoor exhibit, “Bought & Sold: Voices of Human Trafficking” by Kay Chernush, and Edgewood College presented our mural series, “What You See is Not Who I Am.” We were also excited to feature contributing artist Molly Gochman’s Red Sand Project — sidewalk convenings during which passersby are asked to fill pavement cracks with red sand to draw attention to the vulnerable and marginalized people who fall between the metaphoric cracks and are exploited by human traffickers. Molly’s fine art prints, derived from her own Red Sand sidewalk transformations, were on exhibit at the Pyle Center. Many thanks to our campaign partner, the STREETS Project and its co-director Jean M. Geran. We are also grateful for in-kind donations from Crescent Moon Antiques and Salvage and Sepp Leaf Products, which made the Golden Doors to Freedom possible.